For the 24 hours to 23:00 GMT, the USD declined 0.17% against the CAD and closed at 1.3152. On the data front, Canada’s building permits unexpectedly eased 0.1% on a monthly basis in July, defying market expectations for a rise of 1.0%. Building permits had registered a revised drop of 1.3% in the prior month. In the Asian session, at GMT0300, the pair is trading at 1.3129, with the USD trading 0.17% lower against the CAD from yesterday’s close. 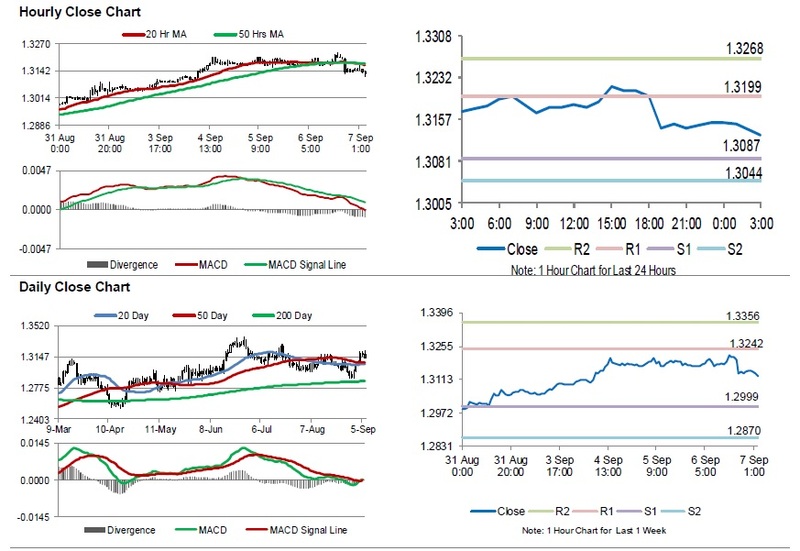 The pair is expected to find support at 1.3087, and a fall through could take it to the next support level of 1.3044. The pair is expected to find its first resistance at 1.3199, and a rise through could take it to the next resistance level of 1.3268. Looking forward, investors would await Canada’s unemployment rate and the Ivey purchasing managers’ index, both for August, scheduled to release later in the day.